Janchi-guksoo was traditionally served on festive occasions such as birthday parties and weddings. The long length of noodles symbolized longevity of a healthy life or a happy marriage. 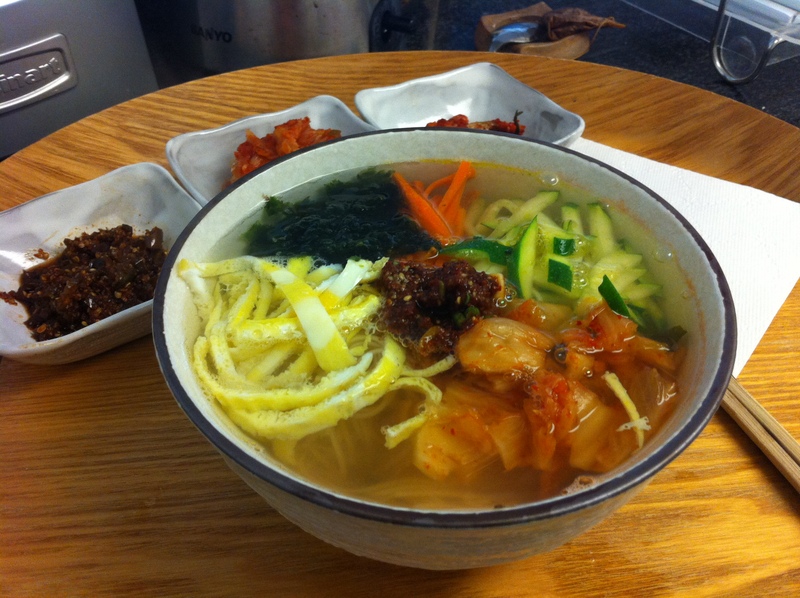 Janchi-guksoo resembles bibimbap with its various vegetable garnishes but it is a noodle soup. 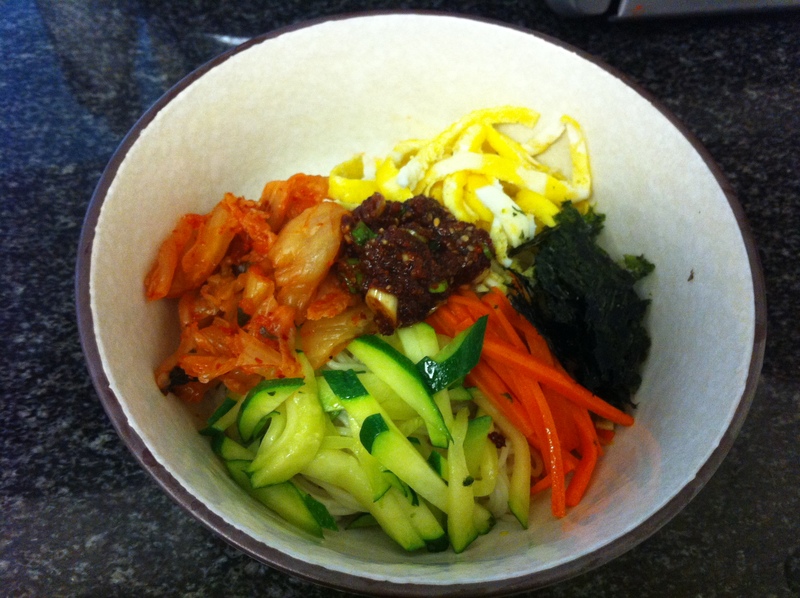 You can use any variety of vegetables such as zucchini, carrots, mushrooms and kimchi. You can also make it with myulchi broth or beef broth depending on your preference. This one-pot dish is not only full of nutrition and beautiful to look at but is also quite a fast and easy dish to make, despite the long description below. Today, I made janchi-guksoo with myulchi broth and some spicy sauce on top, which you can omit if you have children or if you don’t like your food spicy. Make 4-5 cups of myulchi broth (click the link for its recipe). Mix all the ingredients for the spicy sauce. If you are using dried shitake mushrooms, soak it in warm water for about 10-15 minutes until they are fully plumped. 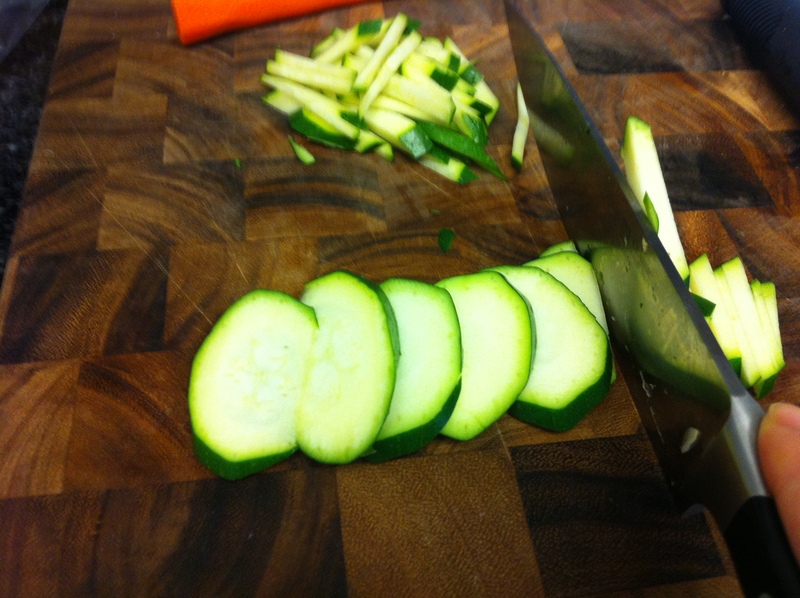 Slice them thinly. Boil about 5 cups of water. In the meantime, spread about 1 tablespoon of vegetable oil evenly around in a small skillet. I used a paper towel to coat the skillet evenly. Add a pinch of salt in the egg. 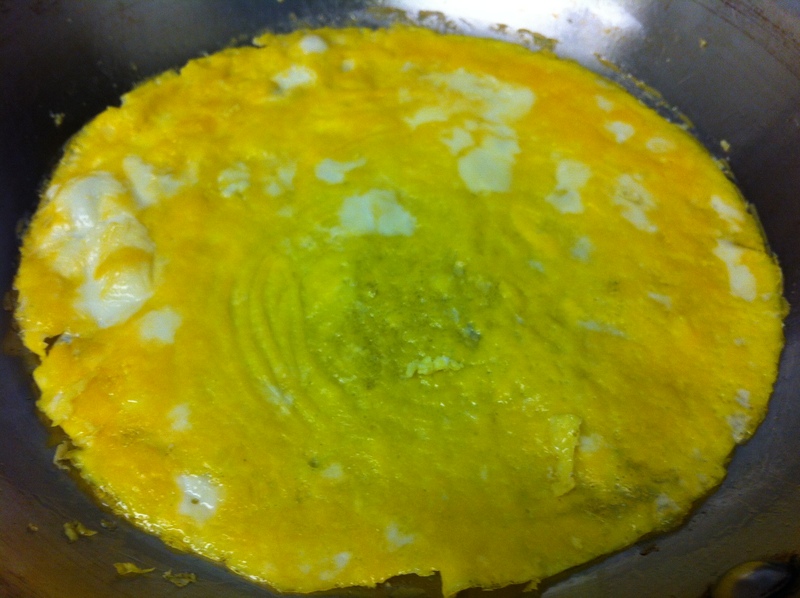 On low heat, pour in the beaten egg and spread it out thinly and evenly. Cook very slowly on low heat until the top surface of the egg is fully cooked without burning the bottom. You probably want to use a well-seasoned skillet or a non-stick pan. Gently remove the egg trying not to tearing it, fold it into half, and cut it across into thin strips. 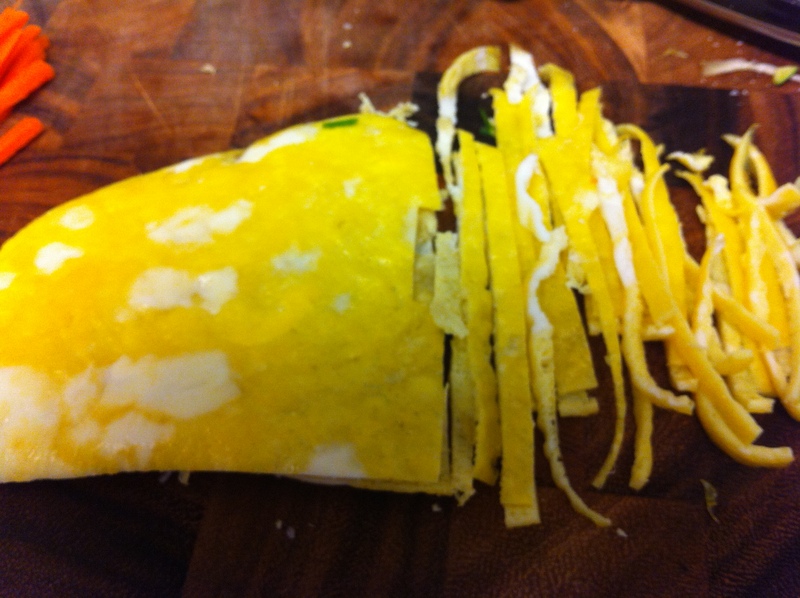 If you accidently tear the egg, which I do often, don’t worry since it is cut into thin strips anyways. This is called dalgyal-jidan (달걀지단) in Korean. 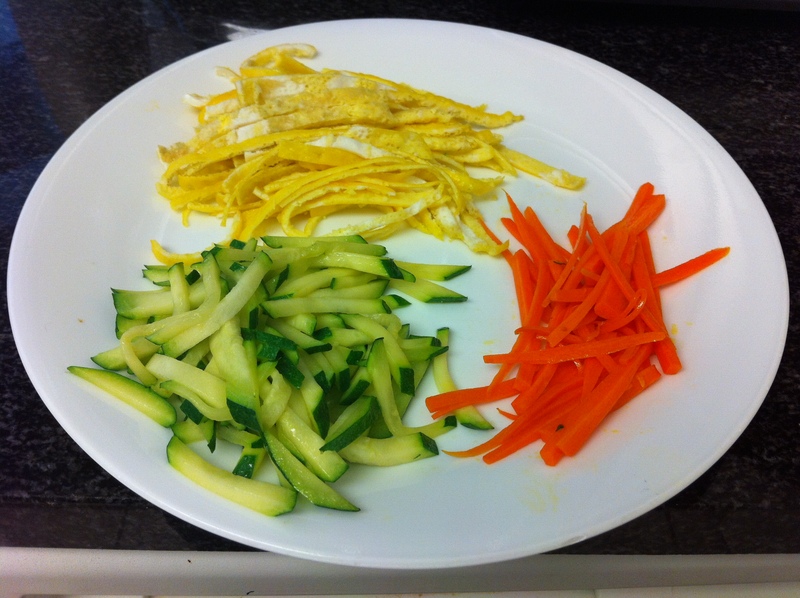 Sauté the zucchini, carrots and mushrooms separately with vegetable oil. I didn’t have any mushrooms today and used grape seed oil to sauté the vegetables. 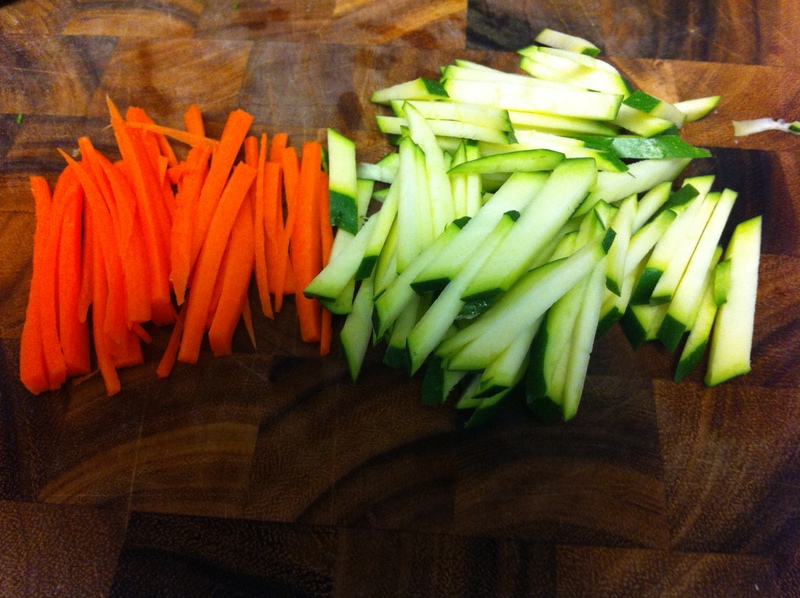 Place each of the vegetables on a dish for later use. 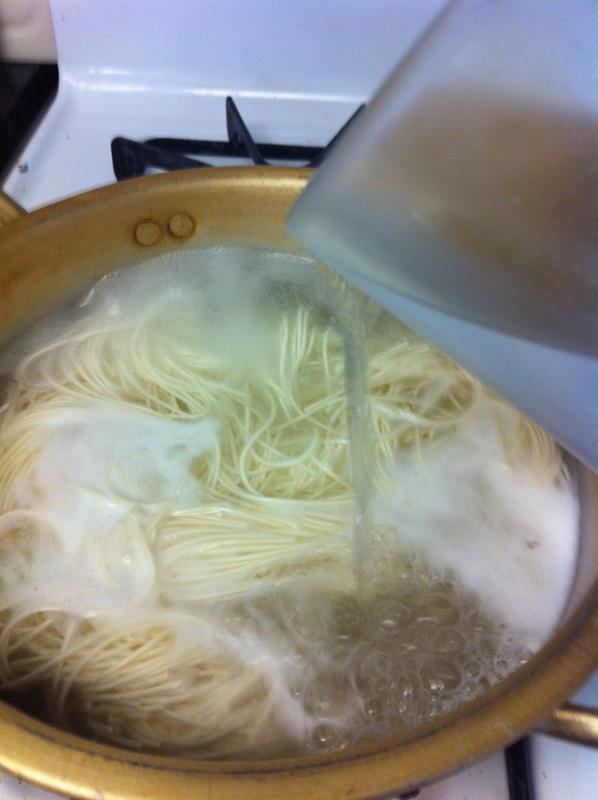 When the water in step 3 boils, add the noodles and stir. 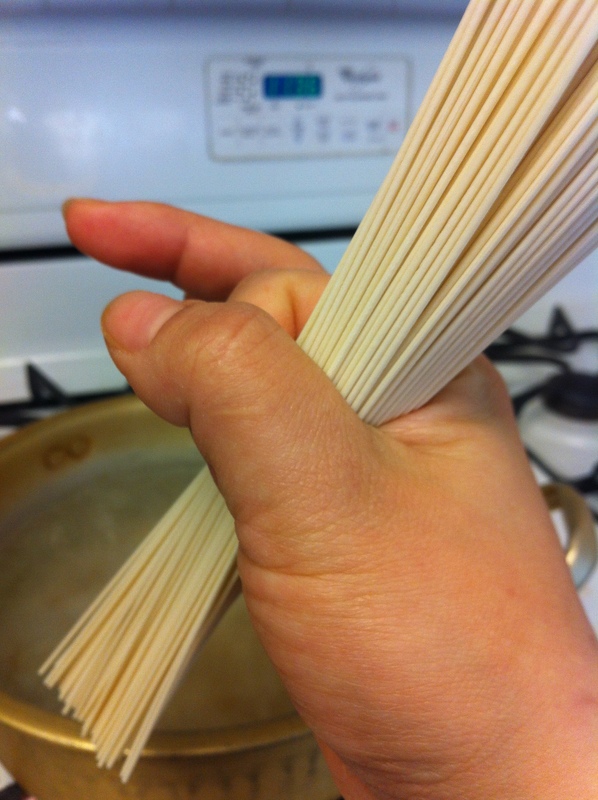 One serving of somyun is as the picture below when held between your thumb and index finger. When the water comes to a boil again, add about 1/2 cup of cold water and stir. Repeat this process once more. 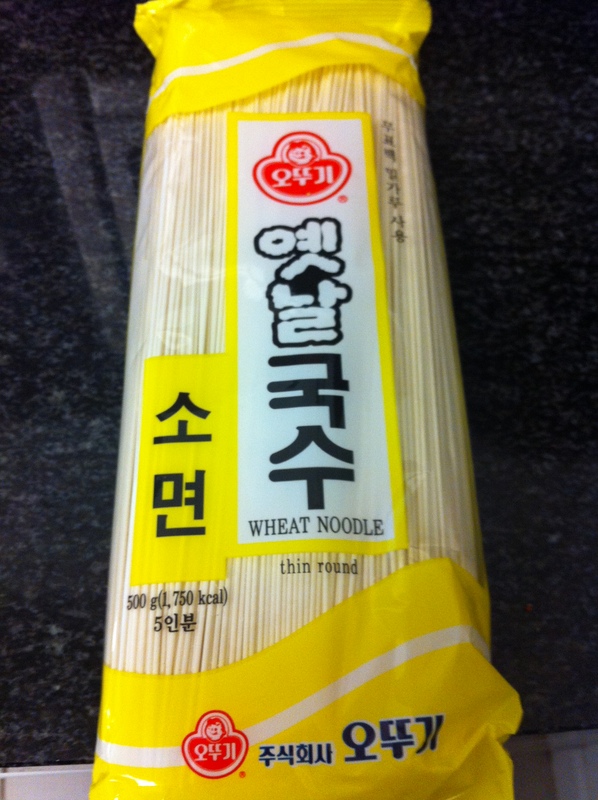 This insures that the somyun (소면, Korean thin noodles) stays firm and chewy. It should take about 7-8 minutes from the time you add the noodles. When the noodles are done cooking, quickly rinse them in cold water several times to stop the cooking process. Divide them into 2 parts, and place them into 2 separate bowls. Add the sautéed vegetables, dalgyal-jidan (달걀지단, egg strips), kimchi (김치) and crushed gim (김) individually in a circle on top of the noodles. 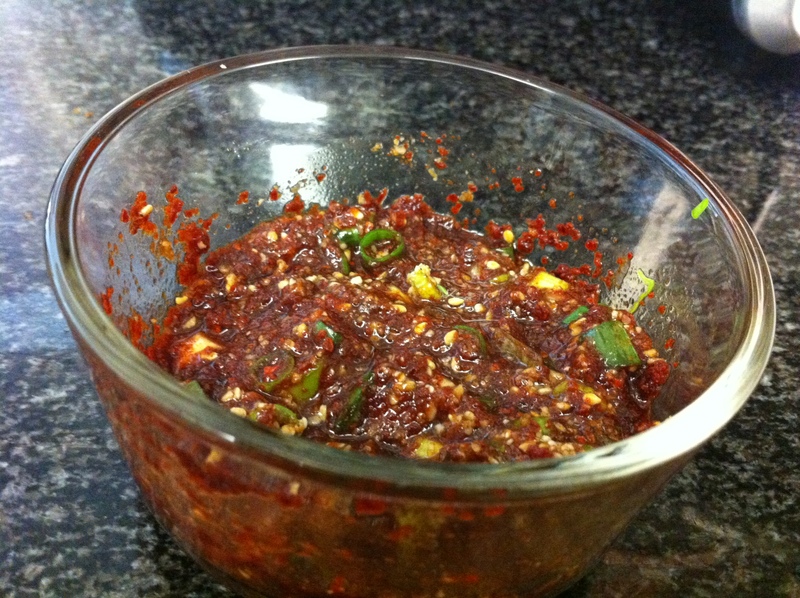 Place a tablespoon or so of the spicy sauce in the middle if you are using it. Gently pour in hot myulchi broth on the side so the placements of the garnishes are not disturbed. 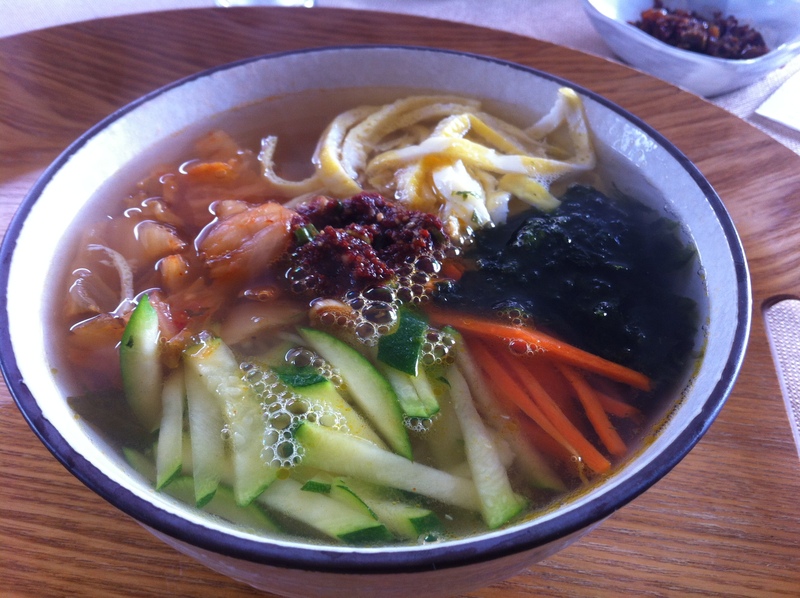 This entry was posted in Good for dinner, Good for lunch, Main Dish, Noodle Dish and tagged Noodles, Somyun by gangnamkitchen. Bookmark the permalink.